on september 25, 2005, the uk prime minister , Tony Blair, indirectly divulged his intentions of not supporting the Kyoto Protocol -- a global treaty to combat climate change. Blair in the special opening plenary session of the Clinton global initiative, ' Perspectives of the global challenges of our time', held in New York and hosted by the former us president Bill Clinton, said, "...I think, whether for reasons to do with concern over global warming or energy security and supplies, I think this issue is coming together in an important way...I'm changing my thinking about this in the past two or three years. I think if we are going to get action on this, we have got to start with brutal honesty about the politics of how we deal with it. The truth is -- no country is going to cut its growth or consumption substantially in the light of a long-term environmental problem. What countries are prepared to do is to try to work together cooperatively to deal with this problem in a way that allows us to develop science and technology in a beneficial way." Hullabaloo follows This statement, naturally, created furore world over. 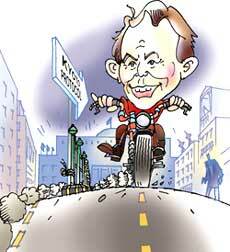 Blair's u-turn may mean an end to the Kyoto process, many argued. They had good reason to believe that without the uk -- a key player -- there would be no support to the protocol from Europe. It is interesting to note that Blair made this statement at a time when the Labour party government was facing the embarrassing prospect of failing to meet Britain's Kyoto targets to reduce greenhouse gas emissions, since it came to power in 1997. To many, this statement indicates Blair's changed views on combating global warming, which mirror those of us P resident George Bush, and oppose negotiating international treaties such as the Kyoto Protocol. Blair's admission flies in the face of his promises made in the past two years when he had made climate change one of the major themes of his chairmanship of the g 8 group, comprising of the world's richest nations. Questioning ipCc The British prime minster's statement may also have roots in what happened in the uk while the July 2005 prestigious g 8 summit was going on. As the summit started, the uk's Lords Economic Affairs Committee pressed the government to review its climate change policy. It said that the science of climate change leaves considerable uncertainty about the future. "Because the Kyoto Protocol will make little difference to rates of warming and because a continuation of the same approach focusing excessively on emission reductions is likely to fail, uk should take a lead in exploring alternative approaches based on agreements on carbon-free technology and its diffusion. There are concerns about the objectivity of the process of Intergovernmental Panel on Climate change (ipcc). Positive aspects of global warming appear to have been downplayed in the ipcc reports," the committee added. Eyebrows being raised on the findings of ipcc -- a premier scientific organization, which assesses the worldwide impacts of climate change -- is a good enough indicator of uk's changing position. During the New York debate, Blair (like president Bush) enthusiastically focused on technology-led solutions -- a proposition rejected by environmental campaigners and some Third World leaders. Tony Juniper, executive director of the international campaign group, Friends of the Earth, criticised the prime minister's comments as 'extremely retrograde and dangerous'. To the PM's defense However, a spokesperson of the government said that the prime minister's comments did not signal the end of Kyoto. "Blair points that we can't get into a position of 'it's either targets or science and technology'; we need to start from a position where we incorporate both these points of views." He added that Blair had "reiterated the fact that we don't just have a situation in terms of climate change, we have an international political situation that needs to be borne in mind." In spite of these assurances, environmental groups are unconvinced about Blair's intentions. More importantly, the g-20 is watching.